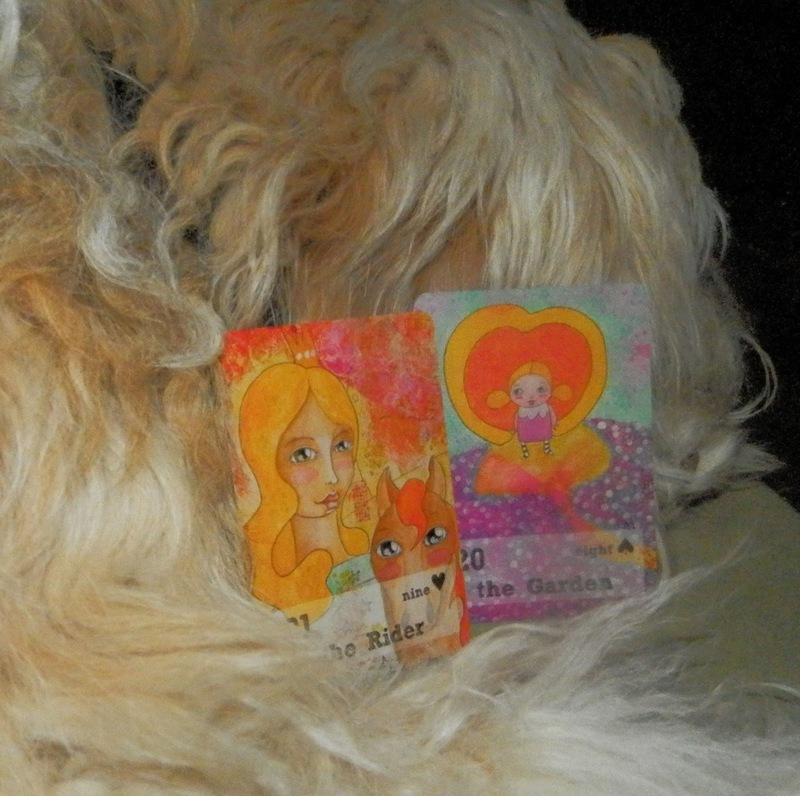 Today's Draw: Rider + Garden from the Whimsy Lenormand by Pepi Valderrama. Do you watch the news? How do you get your news? What benefit do you derive from being on top of the news? When I first saw this combination I thought "the news". The Rider is a messenger bringing news and The Garden is the public or society. So it's easy to see how I drew that conclusion. The constant barrage of "bad news"...and let's face it, the news is largely bad...is just too much for me. I have a pretty clear vision of how I'm meant to serve on this earth and it's about raising spiritual consciousness. It's not about traveling to war torn countries with humanitarian aid, administering to the ill, picketing the White House, arguing about partisan agendas, fighting crime in the streets...it's not about anything they cover on the news. The news is just story after story reminding you what is going wrong in the world, with an occasional story of something right thrown in to silence critics such as myself. It's depressing. It lacks hope. And it drags me down into the abyss. It serves, in my opinion, to chip away at spiritual consciousness through its inherent gloom. The interesting thing about not watching the news or reading about it is that I somehow manage to have some awareness of the topics of the day. Unless you're completely unwired in today's world, you're going to read a Facebook update, catch something on a search engine, get a glimpse at a main news story while looking for something better meant for the style section. People are going to say something to you, ask for your opinion. You can't avoid it. And I'm good with getting my news from these sources and if I want to know more, seeking it out for myself. There's a woman named Jill Bolte Taylor that was a neuroanatomist who had a stroke. At first, she couldn't walk, talk or remember details about her life. But while in recovery, she had a heightened sense of the energy behind the people who walked in and out of her hospital room. Because of that, she advocates for people to take responsibility for the energies around them and for the energy they bring to others. One of her quotes became an Oprah classic, "please take responsibility for the energy you bring into this space." Watching the news brings a certain energy into my space. And it's an energy that does not leave me uplifted. Somewhere along the line, I realized that and stopped bringing it into my sphere. The same is true for negative people, certain websites and TV shows, certain types of art and music...I just have no place for them in my sphere. We are all affected differently by different energies and we all get to choose where we invest our attention. Being raised in a society and household where news time was the most important time of the day, I had some guilt about turning my back on it. Temporarily. I'm glad news is out there, because information is good. And I'm also glad it's optional, because I don't want the drone of it in my space. Thank you, Tierney, for so clearly putting into words the very reasons why I too do not actively seek out "the news".